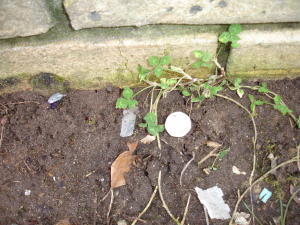 Observation - white clover + 50 p - UK and Ireland. Description: small straggly plant with tri-foil leaves with white markings. I am not sure about the tongue making the leaves slightly elongated. small straggly plant with tri-foil leaves with white markings. I am not sure about the "tongue" making the leaves slightly elongated.